In traditional Finstad fashion, Sarah also kicked off her diving career tucked under Bill’s arm when she was too small to lift a tank. A naturalist and educator at heart, Sarah finds her joy helping others experience and understand the world we live in. Sarah earned Bachelor’s degrees in Ecology/Evolution and Environmental Studies from UC Santa Barbara, a Master of Science in Environmental Education from Southern Oregon University, and a Master of Science in Applied Marine Science from CSU Monterey Bay. Sarah has had a broad set of professional experiences relating to marine ecology and education, including sustainable seafood education for the Sea Center in Santa Barbara, research assistant counting fish on the limited-access Palmyra Atoll in the Central Pacific, high school science teacher in the Los Angeles area, fisheries biologist for the California Department of Fish and Wildlife, and South Coast Marine Protected Area science integration fellow at California Ocean Science Trust. 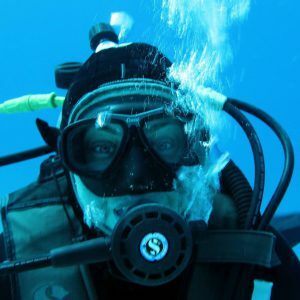 Sarah is currently spreading her fins as a scuba professional – leading dive trips and teaching scuba as a NAUI instructor.